From book to film, book to stage or stage to film, literary works often make successful transitions to new media, but a theatrical interpretation of a film is one of the most difficult to pull off. How to cram all of the colour and spectacle of a much-loved feature on to a few square metres of bare boards? And how to make it work as a musical? Amélie was an award-winning, quirky and nostalgic French romantic comedy released in 2001. Anyone who has seen it will have strong memories of its unique look and of the charismatic performance of Audrey Tautou as the shy waitress Amélie Poulain. 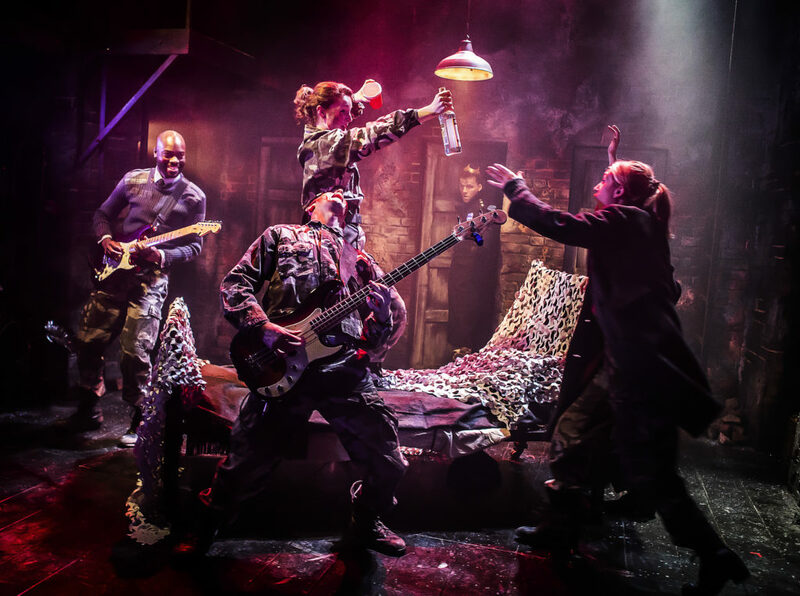 The Watermill Theatre is staging its own winning production of a musical adaptation of the film, written by Craig Lucas with lyrics by Nathan Tysen and Daniel Messé, who also wrote the music. Originally premiered in the US in 2017, this new version has been re-worked for a British audience. According to Director Mike Fentiman, ‘Amélie is a musical that seeks connections… [with a] strange, foreign, melancholic, philosophical, gentle, elusive world’. Watching this celebration of Parisian life after the disastrous fire at Notre Dame was a particularly poignant experience. Almost the entire story of the film is told on stage in a series of twenty five musical episodes that amongst others reference Sondheim, Lloyd Webber and gospel music. Amélie is brought up in the seventies by remote parents that protect her from the real world and from real feelings. She works as a waitress in a Paris café populated by lonely eccentrics who she determines to try to help, until she finally finds love herself. The writing is witty and satisfyingly avoids the obvious. The first number contains a lovely theme that recurs throughout the show, performed by the entire cast playing, amongst others piano, flute, percussion strings and an accordion. 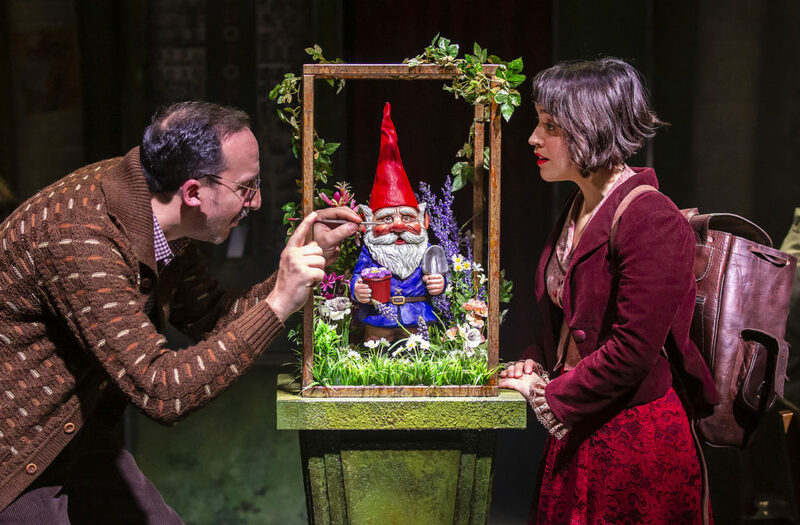 This is a multi-talented group of performers, led by the charismatic and ‘mignon’ French-Canadian Audrey Brisson, with Chris Jared as Nino Quincampoix, the photo-booth obsessive, with whom she quickly becomes fascinated. His singing voice is a delightfully mellow contrast to her brighter sound. Since the story is set in Paris in the 1990s, there is even a rollicking pastiche by a brilliantly swaggering Caolan McCarthy of Elton John’s ‘Candle in the Wind’, which was performed in 1997 at the funeral of Princess Diana. When much of the rest of the show is so animated, Johnson Willis brought a pleasingly quiet poignancy to his portrayal of Dufayel, the ‘glass man’. There were other delightful moments from the entire cast, not least Samuel Morgan-Grahame as Joseph and Fluffy, who managed to make a simple telephone call hilarious. The design, by prize-winning Madeleine Girling, is simply a marvel. The stage at the Watermill is tiny, and enormous creativity has gone into providing spaces in which to represent the film’s many scenes. There were audible gasps of admiration from the audience at the moment one aspect of the set was revealed, with some wonderful detailing that beautifully captured the spirit of the film. Somehow two pianos (with some unexpected surprises within), a dozen performers acting and singing whilst playing violins, cellos, double bass, flute and accordion and a photo-booth on wheels all manage to simultaneously bring the small space to delightful life thanks to the immaculate direction of Michael Fentiman. Movement direction by Tom Jackson Greaves deserves a special mention. This is a fast-moving, feel-good and heartily recommended show.